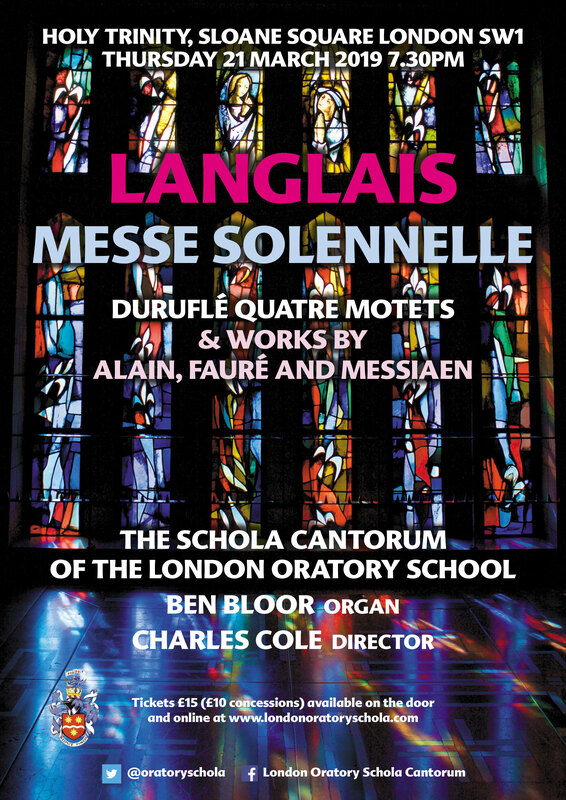 2019 marks the 70th anniversary of the Messe Solennelle by Jean Langlais (1907-1991) the French organist-composer who was Titulaire at Ste-Clotilde, Paris. The boys of the London Oratory Schola will be performing the Mass in a Concert at Holy Trinity, Sloane Square alongside works by Maurice Duruflé, Olivier Messiaen, Gabriel Fauré and Jehan Alain, all French composers. The concert takes place on Thursday 21 March 2019 at 7.30pm and is directed by Charles Cole and accompanied by Ben Bloor. Tickets are available here at £15 (£10 concessions). To visit the Schola’s website please click here.